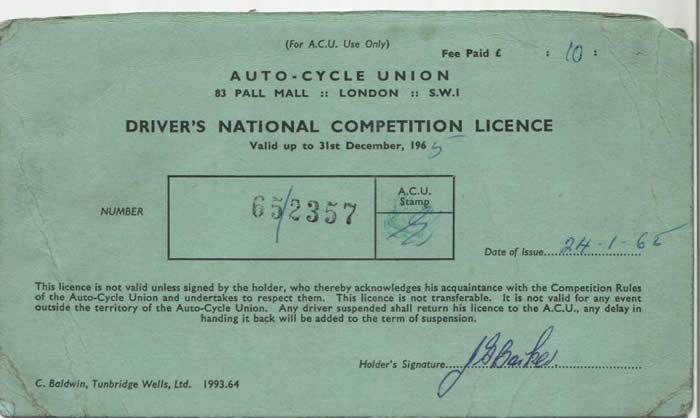 My motor cycle days started in 1963 in England, my first bike being an NSU 50cc Quickly. From there I progressed to an NSU 250cc Max, and that is where my love affair (or obsession) with NSUs began. As I couldn’t afford to race on the track, I had to settle for the occasional Hill Climb. I remember riding against Australian Kevin Cass at an international hill climb, he was on a works Honda after competing at the Isle of Man TT. From there I moved on to being a sidecar passenger – being only 55 kilos wet through – I was in great demand!! 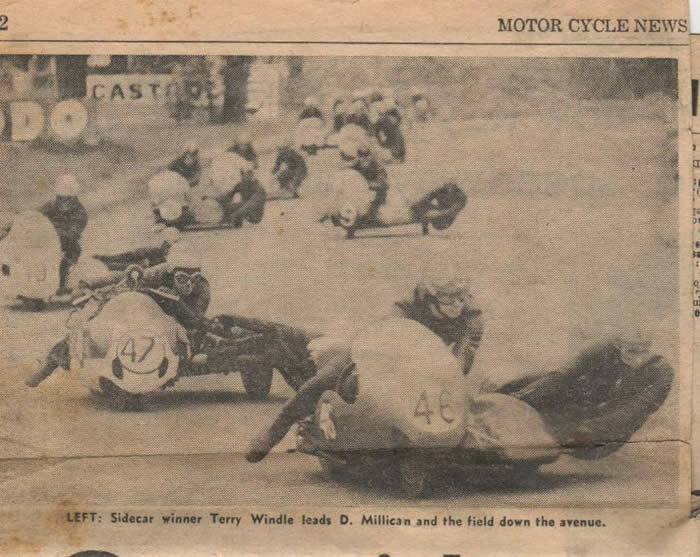 It was a lot of fun racing against the likes of Mac Hobson and Terry Windle (who is now famous for his building of sidecars.) GB is the passenger on No.9 outfit at Oulton park in 1967. By the time I reached 22 yrs old I was on my way to Australia and finished with motor bikes - or so I thought!! 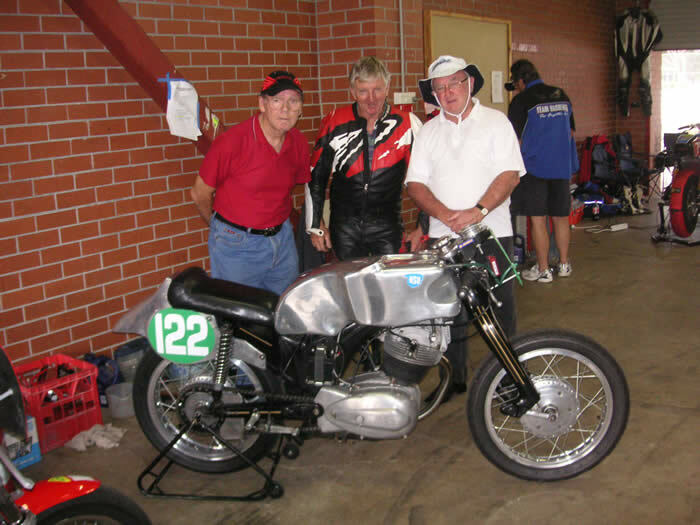 Watching the Historic Racing at Lakeside many years later, a chap named Charlie Henry who was spectating beside me happened to ask me what kind of bike I had. I explained to him that I didn’t have one at the moment, but if I ever found an NSU Supermax for sale, I would love to own one again. Well you guessed it!! Charlie said he just happened to have one at home!! So there started the long process of relieving him of the bike as he was reluctant to sell it, but after many phone calls and constant nagging on my behalf, the NSU finally became mine!! 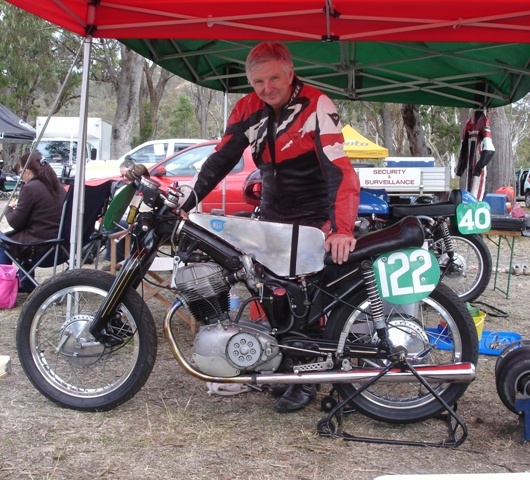 I still own this motorbike and hope to ride it in the regularity event at Stanthorpe this year. I decided to buy it sight unseen and when it arrived it was a heap of junk, the only thing I managed to salvage was the frame, forks and brake hubs, the rest went to the tip and no doubt the seller in Melbourne was laughing all the way to the Bank!! Then started a couple of years of chasing parts from Australia and around the world. After ringing the NSU Guru in Manchester, England, I asked him if he knew of anyone in OZ who could help with an engine or parts. “Aye Lad,” he replied “There’s a chap on t’other side of Island from you” (The Pom’s have no idea how big Australia is, as he was talking about Perth). This proved to be a good lead as I was able to purchase the engine and other useful bits and pieces including the tail fairing (even if it was on the other side of the island ). The petrol tank came all the way from England with a mate who brought it back for me as hand luggage – didn’t want those baggage handlers damaging this alloy work of art!! The engine is a 1955 250cc OHC single cylinder. The camshaft being driven by a pair of eccentric rods, very complicated, but seems to work extremely well. The ignition is electronic from a Honda 4 (half of it anyway), the fuel is Methanol - thanks to Burt Skuse, who finally convinced me to convert to alcohol (not the XXXX type). The engine is dry sump with oil in the frame. The front forks are leading link. Piston by JP Engineering South Australia. Cam shaft by Wade (Melbourne). After many painstaking hours, the NSU racer was starting to come together and finally had its first outing at Lakeside around 1995. From then on there have been many setbacks as there always is in racing!! But hey we’re all having fun, isn’t that the idea!! Racing at the Barry Sheene meeting down at Eastern Creek a few years ago, Eric Hinton came over and had a chat and a look at the bike, and also gave me a few interesting pointers, he had a smile on his face when he saw the NSU, it must have brought back many happy memories for him as he raced a similar NSU very successfully for many years. Finally, I would like to say what a pleasure it has been racing with you guys from QEMSC over the last 15 years or so, as you are always willing to help out when we are experiencing problems. My only regret is I should have done it earlier – too late now!! But it’s not too late for having fun with inspirations like Burt Skuse who looks like he will go on racing for ever and a day, so how can you do anything else but enjoy racing whatever your age? ?